I thought todays post should talk about a common foot condition that you may actually have and not know about. If you suffer from any burning, tingling and /or numbness in your your toes or sometimes feel like your are walking on a stone then this post might be of some help. 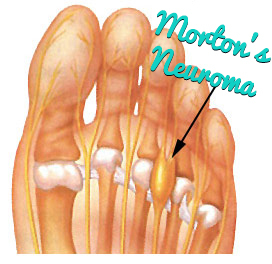 You may have a Morton’s Neuroma. A Neuroma is a thickening (fibrosis) of the tissue surrounding the interdigital nerve. Symptoms are often exacerbated when wearing shoes that are narrow in the toe area. High heels that are narrow are usually the worst culprit. The picture below shows you the most common position for a neuroma. If you are thinking that you may have this problem there are some solutions. -A metatarsal dome is a lump that can be placed under the ball of the foot on an insole or orthotic device (our Bared footbeds have this built in). This metatarsal dome helps to splay the bones in the feet to prevent the neuroma being caught inbetween these bones (this is what causes that horrible sharp shooting pain into the toes). -If wider shoes and metatarsal domes don’t help then speak to a podiatrist about trying injections of local anaesthetic (this can help to decompress the nerve tissue and can give short term relief). Finally Morton’s neuroma’s can be surgically removed. The procedure is fairly simple but they can come back and form a stump neuroma and you will have some loss of sensation in the toes which is not ideal as we do need protective sensation in our tooties! I hope this helps to treat some feet!